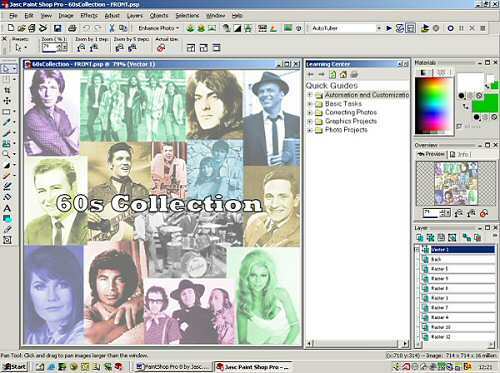 Paint Shop Pro 8 is the latest version of the popular graphics program from Jasc. Ive been using PSP since version 3 on Windows 3.1, and have seen the progress in the design and functionality of the program. I used to have version 5 for the ease of use for bitmaps and version 7 for working with vector graphics, but when I recently rebuilt my PC, I decided to go for the one version, and that was the latest. Requirements: Windows 98, NT 4 with Service Pack 6a, 2000, Me and XP, Pentium Processor or comparable, 128Mb RAM, 200Mb hard disc space, Internet Explorer 5 or later. You will notice that like many new applications, support for Windows 95 has been dropped. This is a continuing trend for software and not a real problem. The interface has had a radical makeover. The toolbars and palettes are all now movable, dockable to the top or side and individually customisable. The dialogs and icons have been redesigned, and finally the acquire button is now a picture of a flatbed scanner (not a handheld). The colour palette is now a materials palette, letting you change between solid, pattern and gradient paints and fills. Gradients can be rotated and the textures can be scaled, or you can load new textures from any supported file format. You can save the settings as a swatch so you can reuse it any time. The dialogs have previews and try before you apply windows similar to the effects browser. With all of this customisation, you can save your workspace, so you can use the program with a particular design. Theres a template for Paint Shop Pro 7 that you can load to help previous users familiar with the old layout. The Layers palette looks comparatively untouched but its use has changed just as dramatically. Layers can now be grouped so you can move any apply effects to them all at once. This includes the opacity and any adjustment layers. The same is true of masks which are no longer treated as an attribute of a given layer, but as layers in their own right. The former Mask menu has been incorporated into the Layer menu but the new system is more logical. The new Learning Centre window guides you around Paint Shop Pro. You can try out new Quick Guides that lead you through a variety of common projects to help you get up and running fast. The Product Tour contains nearly 50 topics show you the many results you can achieve. The help system is detailed, but sometimes there can be no substitute for a manual, which you get if you buy the full boxed version. The new Background Eraser Tool lets you select a coloured area of your image and replace it with transparency. This works best on clearly defined objects, but is a definite improvement instead of using the magic wand to make a selection and promote to a layer and then delete the background. The Warp Brush can stretch, pull, push or swirl areas with ease  allowing you to create caricatures, or you can use the Mesh Warp tool. The Straighten tool lets you straighten scans or digital photos simply by marking a line that should be horizontal or vertical. Simply draw a horizontal or vertical line specifying the direction in which to align the image. All of the retouch brushes that were formerly part of the Retouch tool are now separate brushes. For example, use the Dodge brush to lighten images and bring out details, use the Burn brush to darken areas of images, or use the Saturation brush to increase or decrease the saturation. The Crop Tool provides aspect ratio control to make it even easier to achieve the perfect crop. You can enter the exact dimensions that you want, choose from preset crop sizes, such as 4 x 6 or 8 x 10, and make the edges of the crop snap to the outside edges of the image. The Selection Tool has a new Edge Seeker mode that adds more intelligence as the Freehand Selection tool automatically seeks an edge between mouse click points along an object. You can remove holes and specks from the selection and add an inside feather. The biggest new feature has to be the introduction of Scripts. If you have a series of pictures that you want to change or apply a certain type of effect to, you would have had to do them one by one, or use Jascs Image Robot. Now you can record you edits to a script and apply it to a collection of pictures. There are several preset scripts but you can create your own and edit them using a text editor. The functionality is certainly impressive but the scripting is built on the open source Python programming language which majors on power rather than ease-of-use. Thats no problem if youre recording your macros, but editing is far more demanding. A malicious Python script could format your hard disk but PSPs solution is to limit those scripts that can run disk-based commands to a trusted directory. You can save time by using the Batch Processing as well, such as renaming files or applying a script to a series of images in a folder. 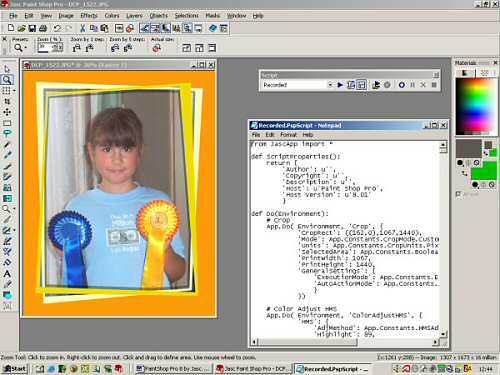 There are other automated tools, such as One Step Photo Fix, auto-sharpen, and red-eye removal. The One-Step Photo Fix button swiftly runs through the default optimisations for colour balance, contrast, clarity, saturation, and sharpness. The Red Eye removal is easier to use, and theres a new Black and White Points adjustment. You can colour correct an image by specifying what colour part of the picture should be black and white, using a dropper. The contrast, highlight and shadow colours are all changed accordingly, which saves time on the numerous tweaks I used to do with Highlight, Midtone, Shadow, Lightness, Gamma Correction, Brightness and Contrast. The default file extension of psp has changed to .pspImage for pictures, with gradients as .pspGradient and masks as .pspMask files, and so on. PSP if fully backward compatible, and you can save as the old formats as well. PSP now supports even more file types, such as the new JPEG 2000 (which offers lossless compression) and PDF, as well as Wireless Bitmap (WBMP). EXIF Photo Information from digital cameras, including date, time, resolution, f-stop, ISO speed, is supported and saved in the images in .PspImage, JPEG, and TIFF file formats. One of best features with PSP is its ability to print multiple images on a single sheet  essential for digital camera users. Printing generally has been updated with the ability to output images at a specific size or scale and positioned anywhere while multiple image printing can be based on a range of grid-based templates with images scaled or cropped to fit their cells. PSPs Browser also uses output templates so that you can control the printing of image thumbnails. The presets include page layouts for 3 x 5, 4 x 6 and business cards, but you can create and save your own. The complete redesign and improvement in the software has definitely worked. When version 6 introduced vector graphics it was poorly implemented, and I only really started to use them when version 7 was released. Using text in version 8 is better than version 7, and also when you close the program you are given a list of open files, which you can select to save or leave as the original. 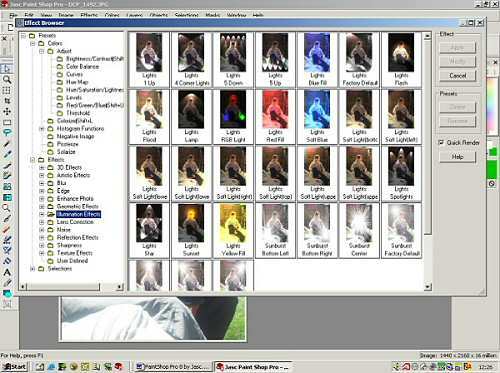 There is a 16Mb update to version 8.01 that fixes a bug with the text engine that prevented some edits from appearing in compositions and some other problems, but with this installed, Paint Shop Pro 8 is a powerful photo editing program that gives Photoshop a run for the money (and it can use most PhotoShop plugins as well). RRP £100, more information at www.digitalworkshop.com or www.jasc.com.